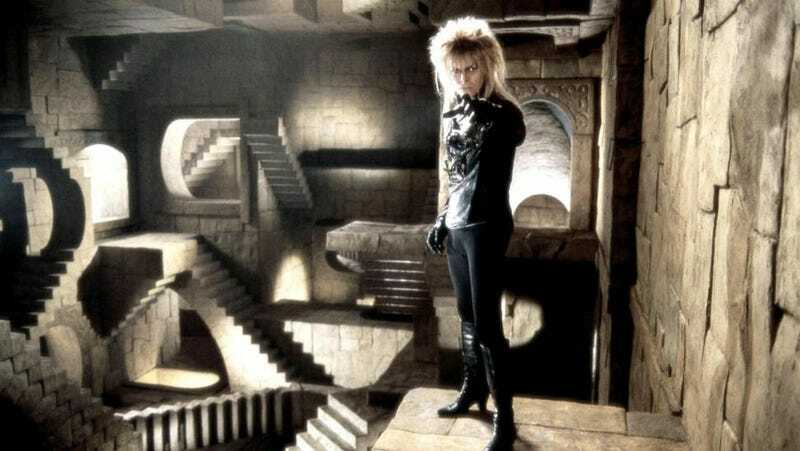 Labyrinth gave us many things. David Bowie in tights. A CGI owl. And, of course, a variation on a paradox that started in ancient Greece. Learn about the iterations of the Liar's Paradox. Everyone remember Labyrinth? If not, let me remind you of one famous scene. Sarah, on her way to the castle at the center of the goblin kingdom, has to choose one of two doors, each guarded by a goblin. One of those goblins tells her that one door leads to the castle, and the other leads to certain death. They can tell her which one leads to which, but there's a problem. One of the goblin guards always tells the truth, and the other one always lies. They then both accuse each other of lying, leaving Sarah confused. Sarah finally asks one guard if the other guard would say that the door she is facing lead to the castle. She figures that, if the first one told the truth and said yes, the second would lie and say no. However, if the first would lie and say no, the second would tell the truth and say no as well. She just has to take the opposite of whatever answer she got. Pleased with her logic she walks through the appropriate door and plunges - to mild inconvenience, not certain death. But then, it was a movie for kids. Sarah fell victim to the flaw in Epimenides Paradox. This is a paradox from the sixth century BC. Epimenides is quoted as saying, "All Cretans are liars. One of their own poets has said so." That's quite a burn, but it's also supposedly a paradox. If the Cretan poet was telling the truth, all Cretans were liars, which means that the poet had to have been lying, because, as a Cretan, he wouldn't be telling the truth. I can see forever! This is an example of a false paradox. It seems to have occurred neither to Epimenides nor to Sarah that, if the poet or the goblin was lying, they could be lying about anything. In other words, the poet could be lying about all Cretans being liars, and the goblin could be lying about either one of them telling the truth — or telling the truth all the time. Although it's not a real paradox, it has had staying power, with people making up different variations on it through the centuries. Saints, scholars, and philosophers — and apparently screen writers — have come up with different variations or examples. Only one of them perfected it, and it only took about two centuries. In the fourth century BC, Eubulides came up with a one-sentence liar paradox - "This statement is false." Try to use that to get you through a doorway. Via Wolfram Math World, twice.